November 3, 2018 1:45 pm | Filed under: Uncategorized | Comments Off on Together Again! A rare treat for pianists is when we get the chance to play with another pianist… on two pianos (not sitting at the same piano, which can also be nice, depending on the size of the bench. =) For me, I'm lucky enough to have had that opportunity semi-regularly with Berlin-based pianist Julia Hülsmann. 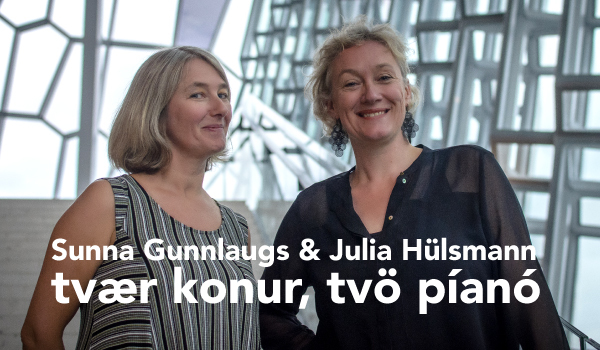 Tonight we will have that opportunity again at the wonderful concert hall Salurinn in Kópavogur, Iceland. If you're in Iceland, please stop by. Tickets are for sale on Salurinn's website. And please check out Julia's music. I can't recommend enough her latest release on the ECM label "Sooner and Later." Comments Off on Together Again!